No need of LN2. Just supply electric power and dry air to realize very low temperature! Not like using LN2, it allows all-night operation without attendance of personnel for watching. It enables stable temperature control as it doesn’t make condensation in the piping. It realizes remarkable reduction of running cost with a small initial cost. 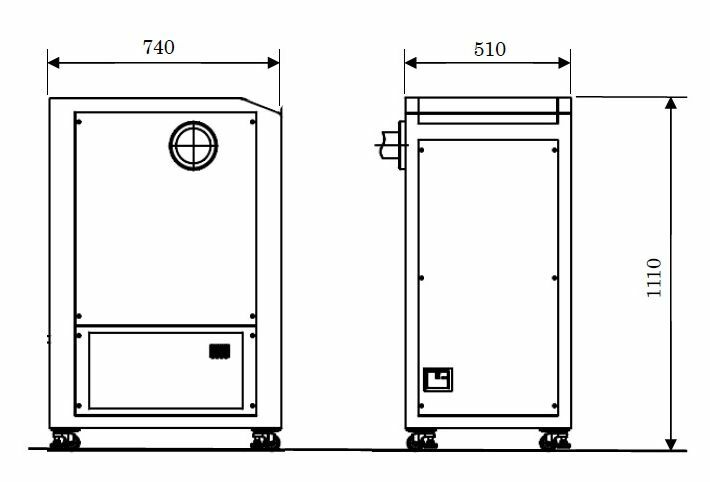 Adopting our unique single compression multi-cascaded condensation refrigerating system. Use of a special dryer for controlling dew point temperature. ULG-9300 reaches 200°C by micro-heater control. The vibration free system is good to use in combination with precision equipment. Energy saving design of small, light weight, quiet equipment needs no help of LN2. Optional air supply chamber enables local temperature control. Originally blended gas of different boiling points is condensed sequentially in the cascaded condensation system to achieve very low temperature. Not like a conventional two-stage refrigerating system, it has only one refrigerator, saving energy and space, making light weight equipment. The simple structure reduces cost of maintenance. lEven if the chamber is big, very low temperature can be achieved easily by controlling air flow. 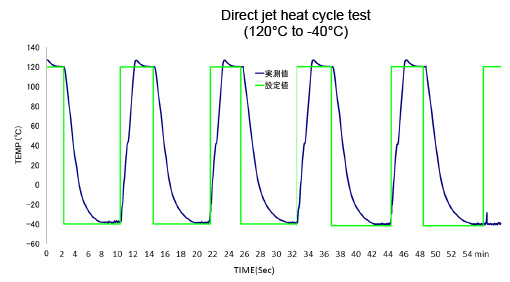 This is an example of a heat cycle test. It shows fast response and stable control, enabling reproduction of hard temperature conditions for accurate test results. Air jet outlet can be connected to a chamber section of a tester directly to get efficiency of cooling specimens. Air jet outlet can be selected from A and B. Please consult the manufacturer for connection.